Bird Management Solutions - Why Proof? 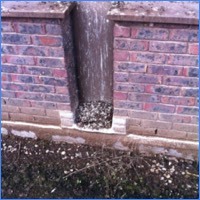 Bird fouling and nesting debris can seriously damage a buildings aesthetic appearance. This can present a negative image of your business to your customers as they contain biting insects and parasites as well as a very unpleasant smell. This negative impact on your business is even greater if you are in the food industry - pest birds are potentially even more of a health risk than rats. 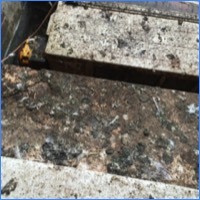 Once a building has been heavily infested with birds it can be very costly to remove the fouling and clean the building, this is why proofing should be carried out before the problem gets too bad. Bird infestation can cause structural damage to your building in a number of ways. 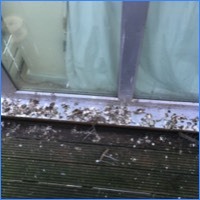 Bird droppings have an acidic content which is corrosive to paintwork and masonry and in some circumstances, the sheer weight of bird fouling can lead to roofs and ceilings collapsing - there can often be several tons of droppings in heavily infested areas. Droppings and nesting materials can also block gutters and downpipes which can damage the pipes themselves as well as causing water damage to the building. Nest debris can also block air intakes and air conditioning units causing mechanical faults which can be costly to repair. Ornithosis is a 'flu-like disease most commonly found in pigeon droppings. Fatalities are rare, but can occur as with any other influenza virus. However a more serious form, called psittacosis can also be present in their droppings - the symptoms of this are more like common pneumonia. More commonly known as 'Pigeon Fancier's Lung' this is a serious allergic reaction which can only be cured by the removal of the birds and their nests. Allergic Alveolitis can result in permanent lung damage. The spores of this fungus thrives in bird droppings and can affect humans who breathe them in. This particularly becomes an issue when birds are nesting on air intakes and spores can be spread throughout the building. Salmonella is present in most pest birds, but features in a high percentage of feral Pigeons and also Starlings. Birds have been known to contaminate water sources so should be considered a health risk at food premises. Gulls in particular have been linked with the spread of E. Coli because they scavenge for food on rubbish tips, sewerage treatment works and sewerage outfall pipes. The E. Coli organisms are present in the gulls droppings and can spread to water supplies and any food premises. Another considerable health risk associated with urban pest birds are the blood feeding insects and parasites that live in their nests and droppings. These include biting bugs, mites, fleas, ticks and lice. Bird nests can also contain other insect pests such as carpet beetles, clothes moths, spider beetles, dermestid beetles and booklice. Dead birds can also lead to infestations of house flies and blowflies. Please note - due to the health risks associated with the removal of bird nests and droppings, only trained and suitably equipped personnel should perform the task. Wet bird droppings are very slippery and can be dangerous where the public has access. The problem is even more significant if the droppings are on emergency stairways or fire escapes. Should a member of the public injure themselves as a result of slipping on droppings you may find yourself liable for compensation. Another risk to public safety is a gull attack. Gulls have been known to to mug people for their food and can viciously attack both people and pets during the nesting season. Gull attacks can lead to severe injuries or even death and have been proven to be on the increase. Other problems associated with urban pest birds are the contamination of food which could lead to prosecution and the noise and foul odours which create unpleasant conditions for customers and employees.